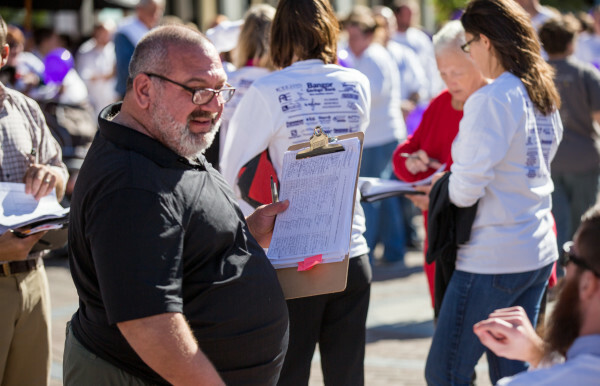 Russell Greenberg of Waltham, Massachusetts, collects signatures in West Market Square in Bangor. AUGUSTA, Maine — A $4 million signature-gathering effort that took nearly a year to complete has succeeded, letting Maine voters decide in November whether to allow a controversial developer to open a new casino in York County. Now the second Maine referendum effort in 14 years linked to Virgin Islands developer Shawn Scott, who made $51 million by selling the rights in 2003 to what became Hollywood Casino in Bangor, will likely move into a public phase after saying almost nothing about the effort so far. Maine Secretary of State Matthew Dunlap’s office said Monday that it validated more than 87,000 signatures from Horseracing Jobs Fairness, a ballot question committee operated by casino backers. That amount is about 26,000 more than the threshold required by Maine law. It came in two rounds after a judge’s April decision to uphold Dunlap’s rejection of most of the 91,000 signatures submitted after a rushed, monthlong gathering process in early 2016. That led backers to submit 65,000 more signatures in December. Of those, 53,000 were validated by Dunlap’s office this time, which was enough when combined with old signatures. The committee has been solely funded by Shawn Scott’s sister, Lisa Scott, who lives in Miami. She is the only officer named for the committee, while Augusta lobbyist Cheryl Timberlake is named as treasurer. The referendum will ask Maine voters to approve a casino with 1,500 slot machines in York County that also would be subject to municipal approval. It would be Maine’s third casino, joining others in Bangor and Oxford. But the only group of people who would qualify for a license under the law are Shawn Scott and his associates. He bought the Bangor raceway, and companies linked to him bankrolled a 2003 referendum in Maine to allow slot machines there. After that, a 2003 report from the Maine Harness Racing Commission accused Shawn Scott of having a web of companies demonstrating “sloppy, if not irresponsible financial management” and flagging 37 lawsuits in four states. After that, he sold his operations to the current operator of Hollywood Casino for a $51 million windfall.